AUSTIN, Texas — With NASA operating on an increasingly tight budget, the agency's ability to launch future large astronomy missions is at risk, scientists said. And this quandary has no simple solution. Astronomy missions that fall under NASA's flagship program are big, expensive endeavors that aim to answer sophisticated questions about the solar system, galaxy and universe we live in. 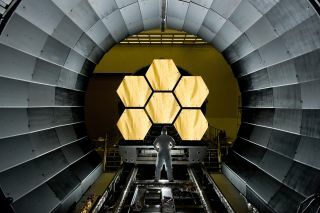 Flagship missions currently operating include the Hubble Space Telescope and the Chandra X-ray Observatory, and NASA's next big space telescope — the $8.8 billion James Webb Space Telescope launching in 2018 — narrowly avoided escaped losing funding last year. But, with funding becoming increasingly scarce, the ability to do these types of missions is severely hindered, said Chris Martin, an astronomer at the California Institute of Technology. Martin is the chair of the Cosmic Origins Program Analysis Group, one of three committees created by NASA to act as forums for members of the scientific community to have input into the scientific and technological issues surrounding the development of programs under the agency's astrophysics division. "We have reached a point where flagship missions can only occur once per 20 to 30 years," Martin said Tuesday (Jan. 10) here at the 219th meeting of the American Astronomical Society. In addition to the cosmic origins committee, program analysis groups exist to discuss the development and execution of projects that examine the physics of the cosmos and exoplanet exploration. Over the past year, the committee members have been focused on devising ways to continue cutting-edge science at lower costs. "It's not just astronomy," James Kasting, an astronomer at Pennsylvania State University and the chair of the Exoplanet Exploration Program Analysis Group, told SPACE.com. "If the government doesn't balance its books and impose some fiscal discipline, we won't have any money for any big projects, including those in astronomy." One of the proposed flagship missions for exoplanet exploration is the Terrestrial Planet Finder, which aims to search for Earth-like planets that might harbor life. The successes of the existing flagship missions are a testament to how much valuable science can be accomplished with these big undertakings. "NASA invested very wisely — the information that we're getting back is fantastic," Steven Ritz, an astronomer at the University of California Santa Cruz and chair of the Physics of the Cosmos Program Analysis Group, told SPACE.com. "But, missions have finite lifetimes. We need to be responsive and find opportunities that are possible." The committees have discussed ways to effectively partner multiple scientific objectives on missions to keep costs manageable. The groups are also concerned with how to avoid stalling the development of technology in the intervening years between flagship missions, when funding will likely be an issue. For the 2012 fiscal year, NASA is slated to receive $5.1 billion for its science programs, of which $672 million is earmarked for astrophysics. This minibus package was signed into law by President Barack Obama on Nov. 18, 2011. "We have to push forward technology in an aggressive way," Martin said. "The big question is: How do we really make a cost-effective mission at this intermediate scale? We need to figure out how to do flagship-style missions at the $1 billion cost scale." But with economic issues plaguing the world over, the battle for funding extends far beyond science and astronomy. "The budget is terrible," Ritz said. "There really isn't a sense of entitlement, because it's far beyond astronomy. We're all world citizens, so we can understand that. We just want to have a vision of how the pace of science should continue."